As reported in the New York Post, Isaih Rosemond appeared before Manhattan Judge John Delury who dismissed the ticket after having to read up on the the statute involved. The judge reportedly offered Isaih an adjournment in contemplation of dismissal, or ACD. Upon learning that the accepting the ACD meant that he would have to stay out of trouble for six months in order for the ticket to be dismissed, Isaih refused to accept the ACD asking for a jury trial instead. The judge being faced with this request actually read the law involved and determined that a unicycle is not described in the law. There is a more thorough article with deeper analysis regarding Isaih's trip to court written in the Simple Justice Blog. 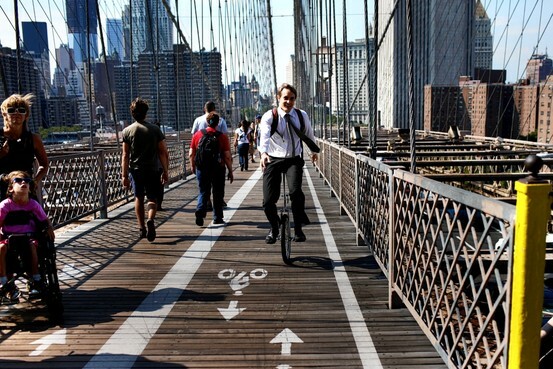 The 2011 New York City Unicycle Festival received some positive press both before and during the event. The photo above comes from an August 26th article in The Brooklyn Paper written by Meridith Deliso entitled Get rollin'! Unicycle Fest returns on Sept.2 The article briefly describes the 2011 festival as it was about to happen. The same article without the photo appeared in the Courier Life's Brooklyn Daily. This second image comes from the The Wall Street Journal in an September 3rd article entitled For One, and for All written by V. L. Hendrickson. 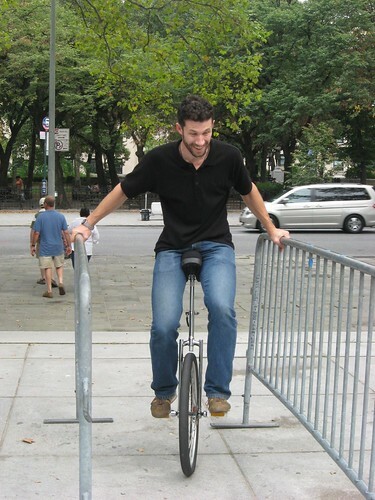 This is a more comprehensive article about the 3 day event with quotes from Keith Nelson of the Bindlestiff Family Cirkus, David Stone founder of the New York Unicycle Club and, Kyle Peterson alias The Brooklyn Juggler who is best known for fighting against the City of New York for being ticketed for legally riding his unicycle. 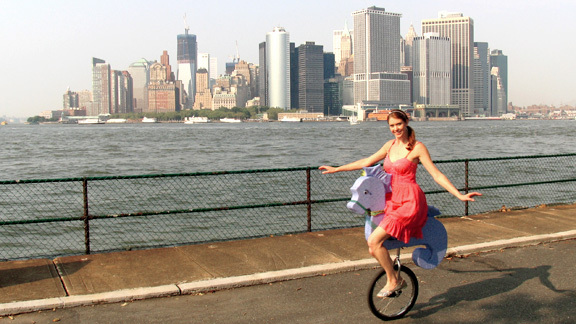 This image is of a young lady, Emily Season, who has tricked her unicycle out to look like a seahorse, comes from an extensive article published on September 6 on ESPN Page 2 entitled: Unicycles make mark in New York City. This article written by Ken Derry, gives extensive coverage to the activities that took place on Governors Island. He has enhanced his article with several personal interest stories from some of the participant unicyclists. 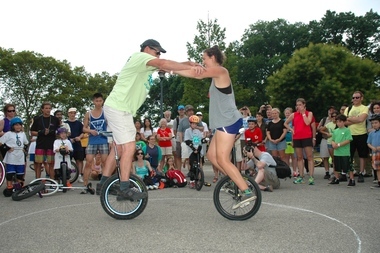 This last image appeared in the Columbia Spectator in an article entitled Unicyclers wheel quirky MoHi fest race written by Steven Lau. Steven interviewed several unicyclist at Grant's Tomb gathering information in order to put together this article. 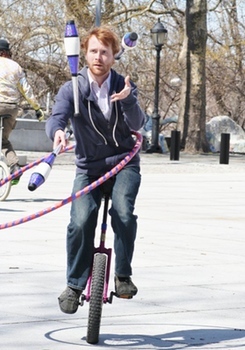 Many more websites that promote events around the New York city have given mention to this years unicycle festival. 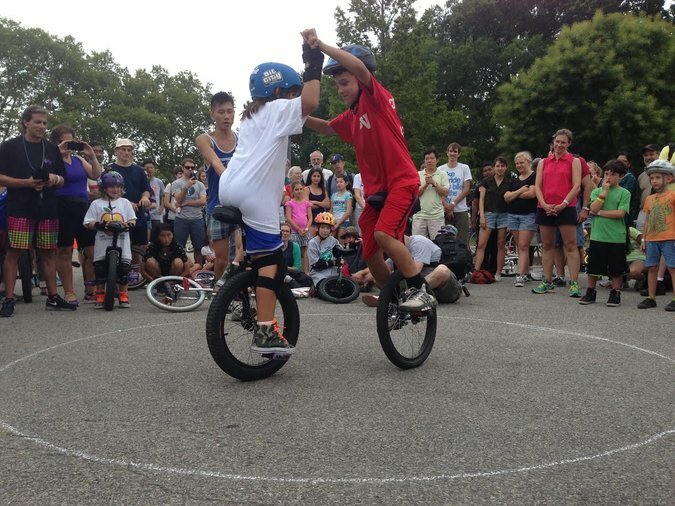 We would like to thank them for helping to promote unicycling in New York and this year's unicycle festival. We hope that even more sites and sponsors will give us recognition for next year's annual event.